You love the classiness of timber structures. You’re attracted to the traditional look of logs. There’s some cool textured stone on your land that would be perfect as a fireplace or pillar footing. Barn wood siding would be nice for the mudroom. And you have your eye on some exotic hardwood for your flooring. How can you possibly combine all these materials? 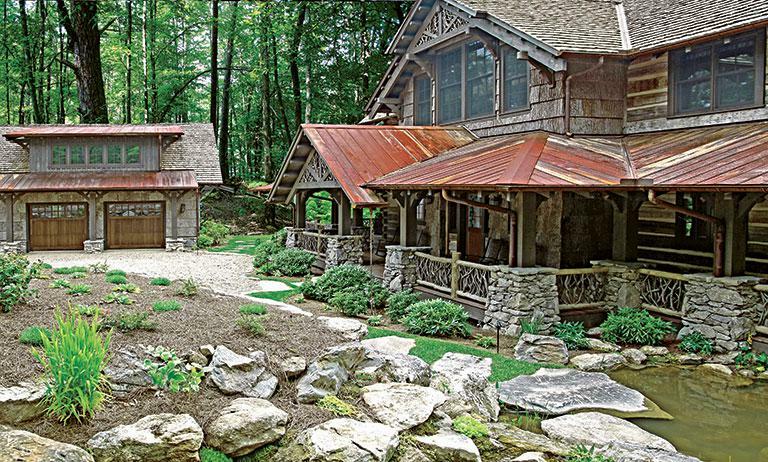 Your dream home might be a hybrid home — a custom wood home that combines a number of building materials and construction elements in the same structure, creating a home that’s far more than the sum of its many parts. There are several names to this type of home, including mountain architecture, natural element, natural material and log-and-timber combo. Many companies offer this type of house as part of their repertoire and may call it something like a signature series. Generally speaking, hybrid homes are those that incorporate a substantial amount of conventional stick-frame construction juxtaposed against more natural-looking materials, such as full-log walls or log veneer, timber frame or stonework. The fact that hybrid homes do such a great job of combining different elements creates a wealth of wow factor — and raises the bar on your ability to customize and personalize your dream home. The possibilities offered by hybrid home construction mean that people who might not have felt comfortable with any one single flavor of home design can venture into new architectural territory. Instead of a home that’s completely log or completely timber, you can create a structure that blends different looks and reflects its natural surroundings. The key to doing justice to all the elements in a hybrid home is using accent materials in all the right places — and knowing when to stop. The more public a space is, the more you’ll want to show it off. So, for example, in the great room, you might want to opt for timber frame construction exposed to the interior or elaborate ceiling truss work that creates a lot of visual attention. And, to some extent, master suites are getting more attention. Their ceilings are the first thing you see in the morning and the last thing you see at night. Kitchens are prime spots for traditional construction, giving you flat walls that can easily support cabinets and appliances. But by beefing up your conventional construction to support a little extra weight, you can add decorative woodwork on the ceiling, or graft on reclaimed wood beams or trim, giving the kitchen more architectural interest and warmth, and a sense of history, too. Outdoor rooms, however, are a good place to put aside conventional construction and let the natural elements of your hybrid take over. Log trellis add-ons are popular options for outdoor rooms, or using decorative veneers like barn board on the walls inside and out to help transition between indoor and outdoor spaces.